I tend to create my best puzzles when I'm waiting for friends at Fenlon's coffee house, counting down the minutes. Today, I was idly playing around with some dominoes when I put them into this particularly interesting arrangement. How would you label each domino with two numbers from 1 to 6 (just like normal dominoes) so that all the dominoes are different, no two like numbers touch, and each number is larger than the ones vertically below it? 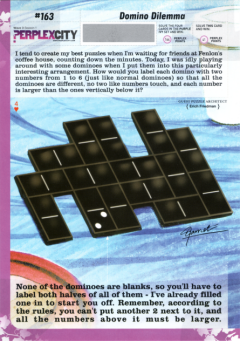 None of the dominoes are blanks, so you'll have to label both halves of all of them - I've already filled one in to start you off. Remember, according to the rules, you can't put another 2 next to it, and all the numbers above it must be larger.